Q. Where is the Museum located? The Springville Museum of Art is located at 126 East 400 South in Springville. The Museum is located 60 minutes south of Salt Lake City International Airport. Directions: From I-15 southbound, take exit 260 east. Continue on 400 South for two miles. Parking is available in the parking lot directly east of the building. Q. What are the Museum's operating hours? Tuesday through Saturday 10:00 to 5:00, Wednesdays 10:00 to 9:00. Closed Sunday, Mondays, and Holidays. Q. If I want to rent the Museum for a special event, what do I do? Please contact our SMA events coordinator for information on rates, available areas, and other pertinent information at 801-489-2727. Q. At what age can children visit the Museum without adult supervision? Children over the age of 15 may visit the Museum without adult supervision. Q. What is the Hafen-Dallin Guild? The Hafen-Dallin Guild is the volunteer organization of the Springville Museum of Art. All our Museum volunteers are part of this organization. The Guild Leadership supports the volunteer program through trainings, recruitment brunches, etc. They also plan and implement annual fundraisers for Museum needs. Q. Is there an admission charge? The museum is free to the public. Q. How can I find out about the Museum's exhibits, education programs, etc.? Please check our website, Facebook, and online community calendars for announcements of upcoming events. You can also sign up for email updates or talk with Museum volunteers or staff to stay up-to-date. Q. How is the Museum funded? 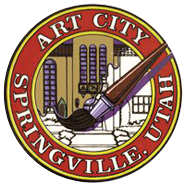 A variety of partnerships fund the Springville Museum of Art, including volunteer and in-kind service, grants, donations, memberships, and the City of Springville. Q. Who designed the structure and in what style? Claude Ashworth was the architect. The museum is designed in the Spanish colonial-style. Q. Who funded the building? Who owns it now? The building was originally funded and built by the Works Progress Administration, the Nebo School District, the City of Springville, and the LDS Church. The City of Springville now owns and maintains the building.